Railpictures.ca - Dave Beach Photo: On March 5, 1978, CP SW8 #6703 is loading the N&W barge Windsor at the ferry slip in Windsor, Ont. Notice that all of the cars are excess height auto racks. The ferry service was only used for cars that couldn’t fit through the tunnel. When the larger tunnel was completed in 1994, the ferry service was stopped. The yard and slip are now a park. The barge Windsor was owned by the N&W and was originally built in Toledo in 1930 as a steam ferry for the Wabash. It was converted to a barge by the N&W in 1969. Internet reports show it being scrapped at Port Colborne in 2007. | Railpictures.ca – Canadian Railway Photography – photographie ferroviaire Canadienne. 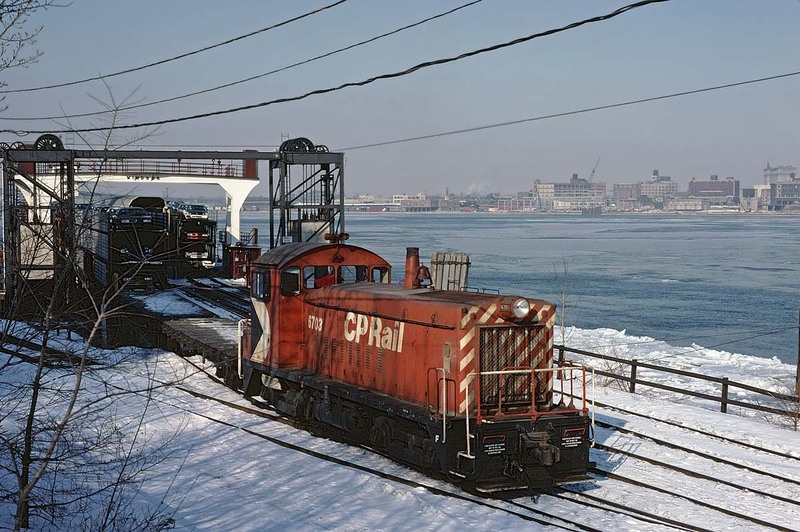 Caption: On March 5, 1978, CP SW8 #6703 is loading the N&W barge Windsor at the ferry slip in Windsor, Ont. Notice that all of the cars are excess height auto racks. The ferry service was only used for cars that couldn’t fit through the tunnel. When the larger tunnel was completed in 1994, the ferry service was stopped. The yard and slip are now a park. The barge Windsor was owned by the N&W and was originally built in Toledo in 1930 as a steam ferry for the Wabash. It was converted to a barge by the N&W in 1969. Internet reports show it being scrapped at Port Colborne in 2007. Good stuff, Dave. A nice look back at the past. Personally, I didn’t shoot nearly enough of this operation. I still regret it. Some of the local fans were often able to ride across the river to the N&W and back to the CP or CN with a certain Captain at the helm. We rode when the car ferries were self propelled and we rode when they were cut down to barges and guided by tugs, either the R.G. Cassidy or the F.A. Johnson. That boat captain and I still do boat photography together. Those were the days. lonloco – Must have been interesting. Not only would it have been expensive to remove the engines, but they would have had to replace the weight with dead weight so they could keep the balance. I had a tour of the lower decks on one of those Barges once while they were loading it. The darkness, noise and the sound of water sloshing around in the bilges scared the crap out of me. What was interesting was that the engines were still in place. Intrigued by rail ferries … only one buffer car used … neat capture indeed!